No doubt most of us will have used Wi-Fi at some point in the past, and there’s no denying that it can be an incredibly useful, especially when our data allowance runs out – but nevertheless, many people are still somewhat hesitant about embracingWi-Fi connectivity. Perhaps the main reason for this is that some of us still harbour concerns about mobile security. However, there are some steps you can take to ensure you stay safe when using a Wi-Fi connection. 1) Protecting your passwords is generally a good idea if you want to protect yourself from would-be fraudsters, so try to use unique passwords for different accounts. Of course, remembering several different passwords can be a challenge. Fortunately, there are password manager programs which can store this information safely. 2) Make sure your firewall is turned on before you access the internet via a Wi-Fi connection. Most operating systems include a firewall of some sort, so check that it’s operating prior to going online. There are also other firewalls out there which offer more robust protection than the standard firewall which is included as part of your OS, so it might be a good idea to install one. 3) Antivirus software may provide you with a crucial early warning in the event that your system is compromised by a hacker. Your antivirus should alert you if viruses are loaded on to your computer or if other suspicious modifications – such as changes to registry files – are made. Make sure you keep your antivirus system up to date so that it offers you effective protection from such threats. There are various free anti-virus apps which if you haven’t already downloaded, you should do so now! 4) Be careful to ensure that your laptop, tablet or smartphone doesn’t automatically connect to any Wi-Fi signal it comes into contact with. Many devices will have this option switched off by default, but it’s better to be safe than sorry so make sure you double check. 5) You should also turn off file sharing if you’re concerned about the possibility of someone else gaining unauthorised access to your device. Many laptops, tablets and smartphones allow users to share files or login remotely. This may be a potential security loophole, so it’s something you should be well aware of. 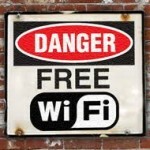 Have you encountered any trouble whilst using public Wi-Fi?